Madhugiri Fort lies in Madhugiri which is in the Tumkur district in the State of Karnataka. Madhugiri is a single hill and the second largest monolith in entire Asia. The small town is at a distance of 100 kms from Bangalore and is famous for its fort and temples. Many tourists visit Madhugiri to visit the fort, which is famous for its architecture and was built by the Vijayanagar Dynasty. The fort is perched on a steep slope of the hill. 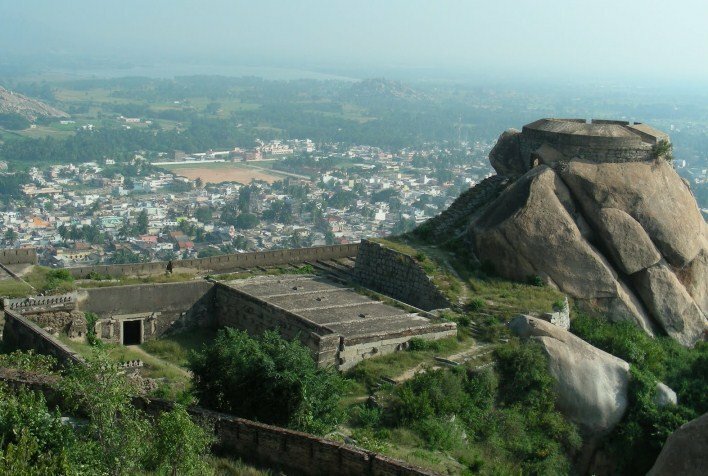 Many tourists come to Madhugiri to visit the fort, which is famous for its architecture and was built by the Vijayanagar Dynasty. The fort is perched on a steep slope of the hill. Best Time to Visit: Between October and March. 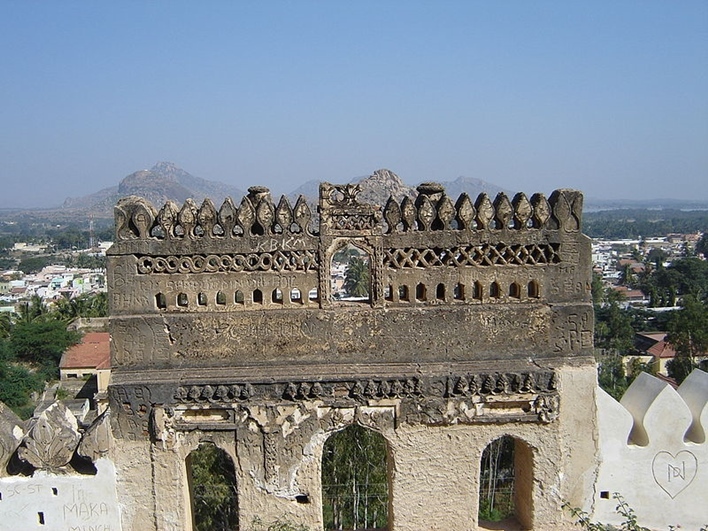 Madhugiri fort is famous for the stone carving as well as the architecture. It was built in the year 1678 by Raja Heera Gowda who belonged to the Ganga Dynasty. Once complete, Hyder Ali added arches, watch towers and circular granaries around the fort. Various rulers occupied the fort and ruled the region. It was also occupied by the British for a short period. The name, Madhugiri, is derived from honeybee colonies that were located in the Northern part of the fort. To reach the top of the fort, one has to climb the steep slope. The climb takes about two hours and various water tanks are visible throughout the way. These tanks were built to harvest rainwater. Beside the fort, lies a temple of GopalaKrishna. It is at the top of the hill, but lies in a ruined condition today. The closest airport is Bangalore, which is at a distance of 100 kms from Madhugiri. The nearest railway station is Tumkur which is at a distance of 40 kms from Bangalore. There is a well-connected road that leads to Madhugiri from Bangalore. A number of buses ply from Bangalore to Madhugiri on an everyday basis.